Srila Prabhupada first published this essay in India, in the old tabloid version of his then-fortnightly magazine Back to Godhead (November 20, 1958). 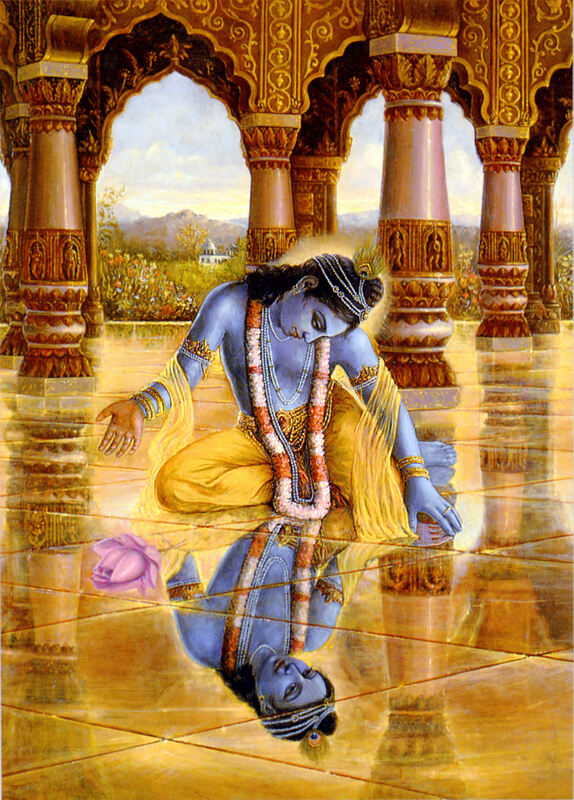 It contains the unforgettable story of "liquid beauty," in which Srila Prabhupada dramatically exposes the underlying principle of human sexuality. This illuminating exposition on the nature of truth and beauty is timeless and startlingly relevant for those in search of the "inner self." There may sometimes be arguments about whether "truth" and "beauty" are compatible terms. One would willingly agree to express the truth, one might say, but since truth is not always beautiful--indeed, it is frequently rather startling and unpleasant--how is one to express truth and beauty at the same time? In reply, we may inform all concerned that "truth" and "beauty" are compatible terms. Indeed, we may emphatically assert that the actual truth, which is absolute, is always beautiful. The truth is so beautiful that it attracts everyone, including the truth itself. Truth is so beautiful that many sages, saints, and devotees have left everything for the sake of truth. Mahatma Gandhi, an idol of the modern world, dedicated his life to experimenting with truth, and all his activities were aimed toward truth only. Why only Mahatma Gandhi? Every one of us has the urge to search for truth alone, for the truth is not only beautiful but also all-powerful, all-resourceful, all-famous, all-renounced, and all-knowledgeable. Unfortunately, people have no information of the actual truth. Indeed, 99.9 percent of men in all walks of life are pursuing untruth only, in the name of truth. We are actually attracted by the beauty of truth, but since time immemorial we have been habituated to love of untruth appearing like truth. Therefore, to the mundaner "truth" and "beauty" are incompatible terms. The mundane truth and beauty may be explained as follows. Once a man who was very powerful and strongly built but whose character was very doubtful fell in love with a beautiful girl. The girl was not only beautiful in appearance but also saintly in character, and as such she did not like the man's advances. The man, however, was insistent because of his lustful desires, and therefore the girl requested him to wait only seven days, and she set a time after that when he could meet her. The man agreed, and with high expectations he began waiting for the appointed time. This man's position was similar to the position of every one of us who is attracted by false, material beauty. The girl mentioned above had a beautifully developed material body in accordance with the desires of her mind, but in fact she was apart from that temporary material body and mind. She was in fact a spiritual spark, and so also was the lover who was attracted by her false skin. Although written by the greatest mundane poet or intellectual, any literature which does not describe the ultimate truth and beauty is but a store of loose stool and vomit of the relative truth. Real literature is that which describes the ultimate truth and beauty of the Absolute.